I tend to find the food offering in large scale shopping centres in the UK more than a little dispiriting. Identikit chain restaurants offering mediocre food at anything but cheap prices tends to be the order of the day in these places. Think Café Rouge, TGI Fridays, Chimicunga and, arguably, most heinous of all Frankie and Benny’s – a made up by a corporate committee “50s Little Italy in NYC” concept restaurant of the very worst kind (deserving of a place in food hell – 8th ring I would say – a piece by Cheese and Biscuits sums up its utter awfulness in a far better way than I ever could hope to). Compare this to the stellar food court offerings you get in places like Singapore (where food court denizens have been known to come with a Michelin star) and it is fair to say we in the UK fall somewhat short. The propensity for dross, on the food front, in shopping centres in not universal. In St David’s 2, here in Cardiff, Wahaca and Mount Fuji (and the soon to open Pizza Pronto) to my mind buck the trend. 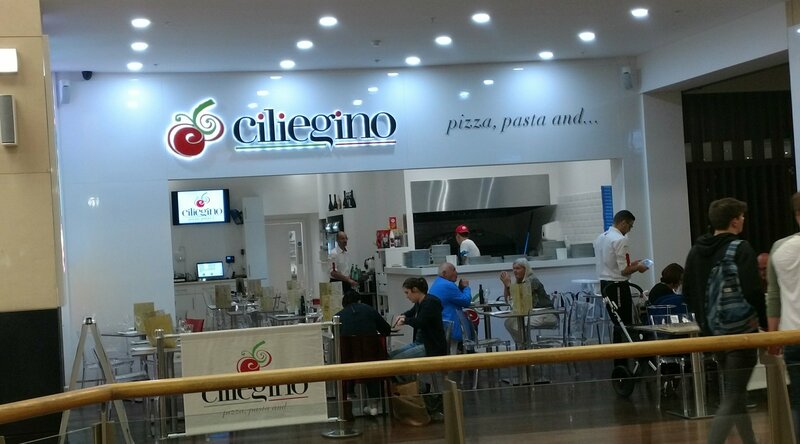 So when I walked past the recently opened Ciliegino (just down from Shake Shack – beloved by many I know, but a total rip off if you ask me) it piqued my interest in terms of its potential to stand out from the crowd. 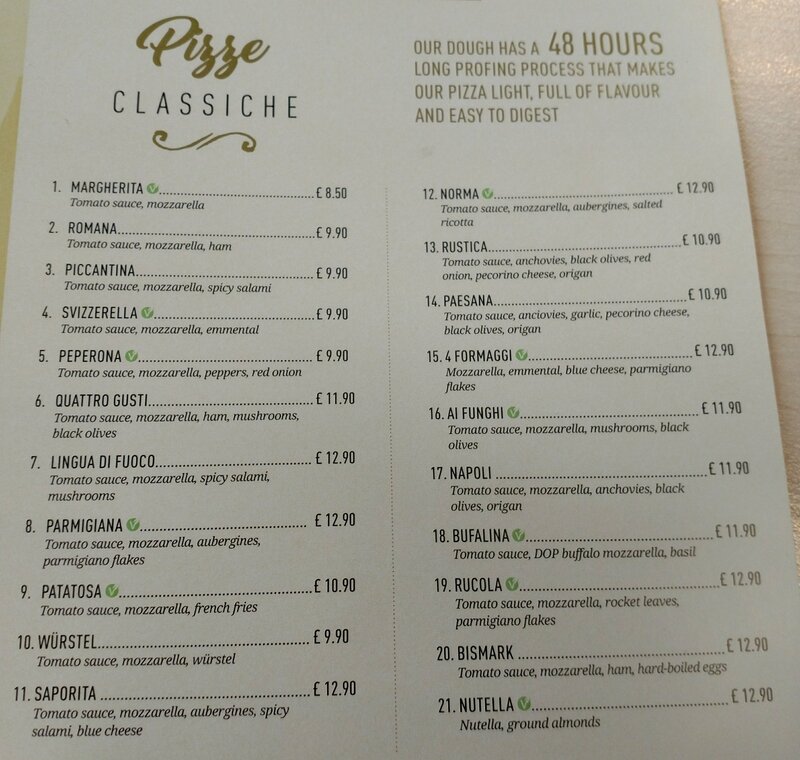 It is a small scale Italian chain (5 outlets I believe) based in Sicily (somewhere where people tend to take their food very seriously) and this is their first foray into the UK market. Interesting (and flattering, I think) that they decided on Cardiff over the likes of Bristol, Birmingham, Manchester et al. Their strategy in Sicily is deliberate placement of outlets in shopping centres, with (so the marketing blurb alludes to) a view to providing a good quality all day offering for those, apparently, who don’t have time to go home for lunch (made me chuckle that – some people may still regularly go home for a meal at lunchtime in Italy, but here I doubt anyone has for nigh on 50 years). 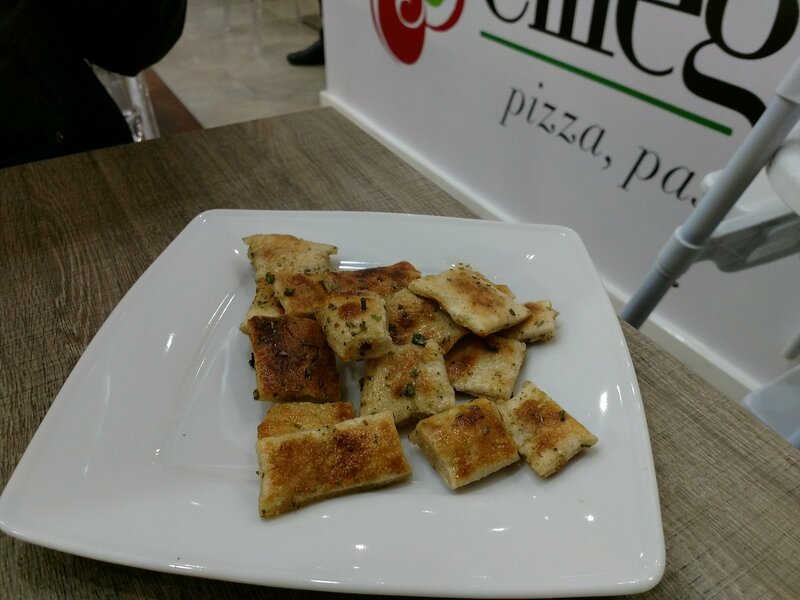 The idea of bringing the centre stone of Italian cuisine (simplicity, based on reliance on just a small number of high quality ingredients) to a shopping centre has the makings (if done properly) of a pretty good idea. Certainly has the potential to add a touch of Italian chic to the shopping centre dining scene. 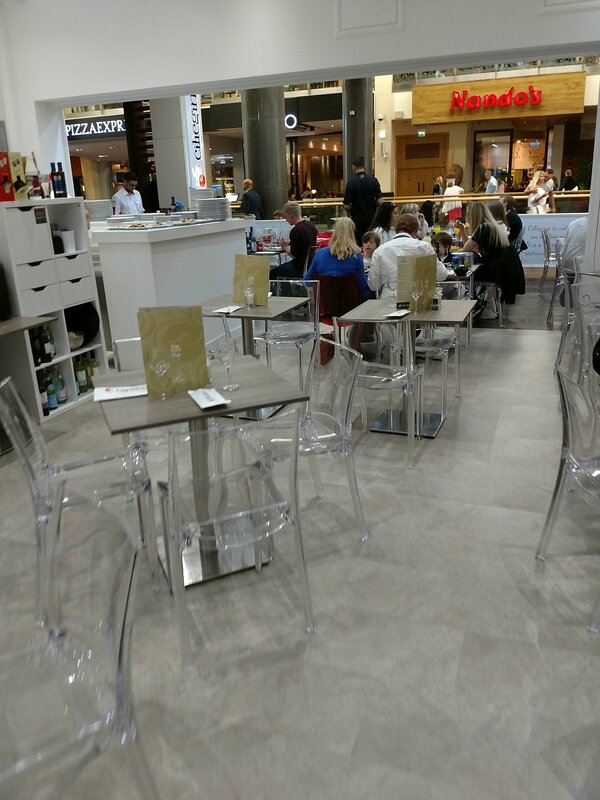 So have they succeeded, where many others have failed (often spectacularly – weirdly the worse offfenders seem to linger the longest, like a bad fart) in bringing something worth going out for to eat in a shopping centre? Both the exterior and interior are quite stark, with an almost brutal minimalism to the place. Reminds me of those labs that have to be totally contaminate free or the set of Moonbase Alpha in, that kitsch 70s classic, Space 1999 (loved that show – epic theme tune). Initially I found it quite cold (white on very brilliant white and clear plastic), but as I sat there it bothered me less and less. It is a lot classier than Chimicunga next to it (what isn’t) and its stark whiteness certainly draws the eyes. 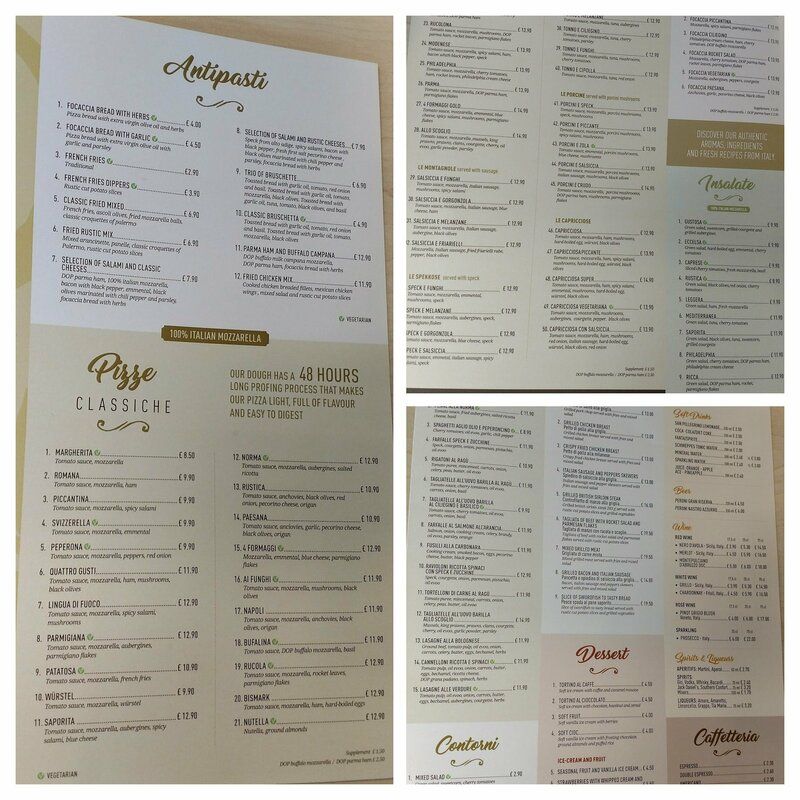 The menu is pretty big (not always bad, but a huge menu does tends to make me a little suspicious as to the kitchen’s ability to maintain standards), with pasta, pizza and meat and fish based mains. Prices range from mains from £8.50 to just shy of £20, so it is not cheap. 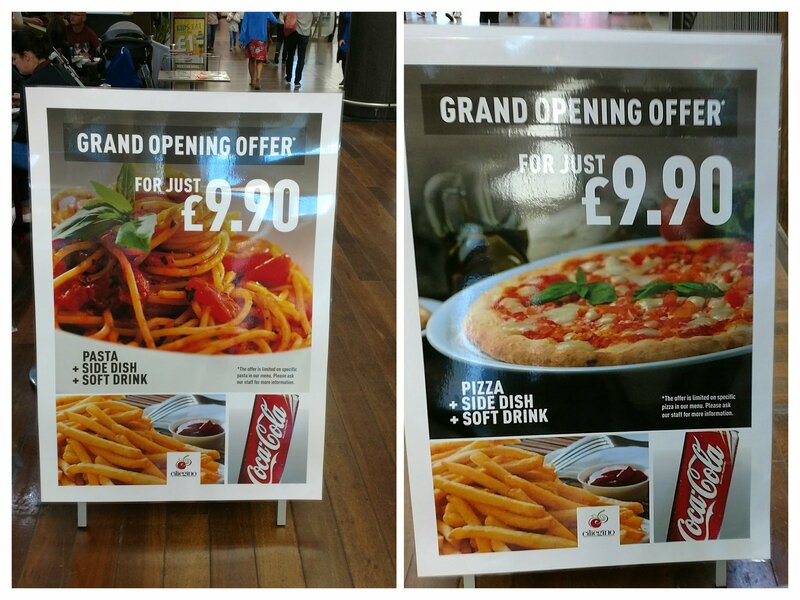 There are currently some pizza and pasta opening offers (a side and a soft drink are thrown in for an all in price). and (I believe) all of the pizzas under the classic section of the menu (best check that as it is based on a snippet of a conversation I overhead that one of the waiters had with an another table, so entirely possibly have I heard it wrong and it is just some rather than all of the classic pizza section of the menu). I was a bit disappointed to see very few truly Sicilian dishes on the menu. The absence, for instance, of that Sicilian classic arancini was particularly perplexing. This place is undoubtedly an Italian based operation, but it has on it’s menu a carbonara with fussili and cream and a pizza (patatosa) with chips on it. So perhaps I shouldn’t take umbridge at seeing such things on an Italian restaurant’s menu? Nope, can’t bring myself to accept that I am wrong in my view that cream has no place in a carbonara and chips are not a pizza topping or a side to a pasta dish). Here I think it is a case of catering to your given market and pizza and chip and chips as a topping on a pizza (oh the horror) is exactly what my friend’s teenage kids would go for everytime. Notwithstanding these misgivings, the pasta dishes did sound nice and true to “classic Italian” form are generally based on only a few core ingredients. Veggies are catered for, although I don’t think their classification of one dish with Gran Padano cheese in it (the lasagne alle verdure) as veggie friendly is correct (I believe Gran Padano is made using rennet). 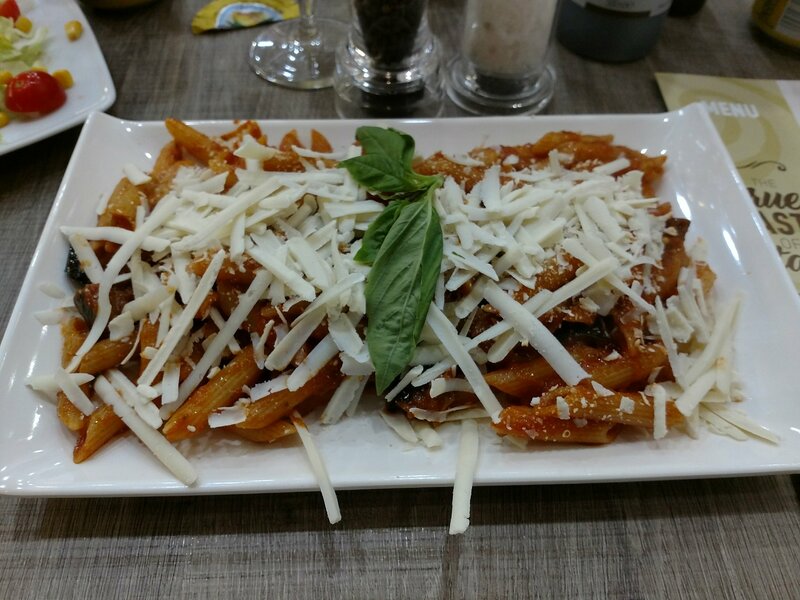 In terms of what to order off the large menu it was always going to be pasta for me and of the many pasta dishes on offer I wanted to try one that could be said to be resolutely Sicilian. On this basis, the obvious choice was the penne alla norma (normally £11.90 solo, but £9.90 with a drink and a side as part of their opening offer deal). A classic Sicilian dish originating from the town of Catania on Sicily’s East coast, it is traditionally made using tomatoes, fried aubergine, grated salted ricotta (a very different beast to standard ricotta) and basil. This was a very nice (generous) plate of pasta – true to its traditional ingredients. A good (not too thick and not too sloppy, with a nice depth of flavour) base tomato sauce was enriched by nicely cooked aubergine and basil. This coated, rather than swamped, some properly cooked al dente (still had a slight bite to it) penne. The dish was completed by a very good sprinkling of salted ricotta. The side salad (£2.90, if not in the £9.90 deal which it was) was a bit pedestrian and came undressed, but olive oil and balsamic were on the table to address this. 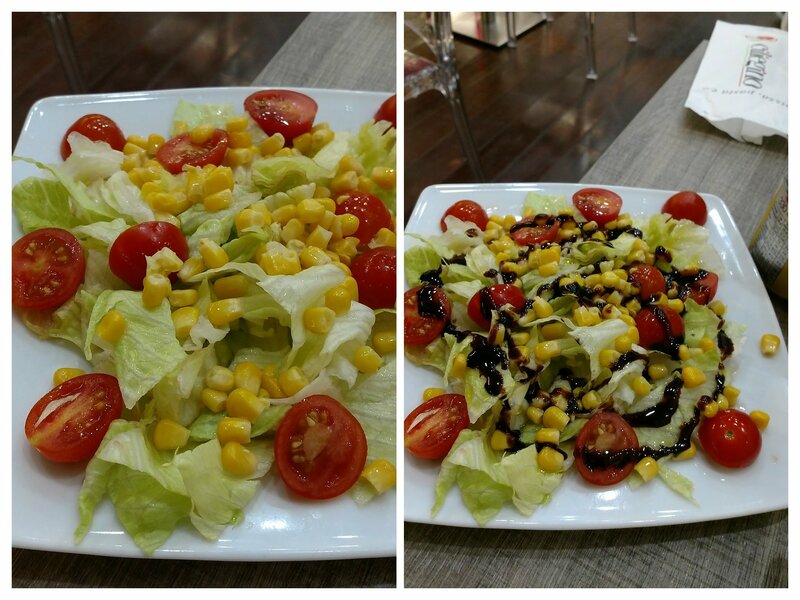 I enjoyed my pasta very much, with it being quite a large portion for lunch (especially with the added side salad). I didn’t feel the need to eat again that day. My dining companion (mate from work) went for the farfalle al salmone alla arancia (£11.90 – not in the meal deal). Again a very generous, portion with a good sauce (not to sloppy so it just coated the pasta) and properly cooked (al dente) pasta. It got a thumbs up on both the quality and quantity front. For parmesan lovers a generous pot of the stuff was on the table (granted rather than in dust form). 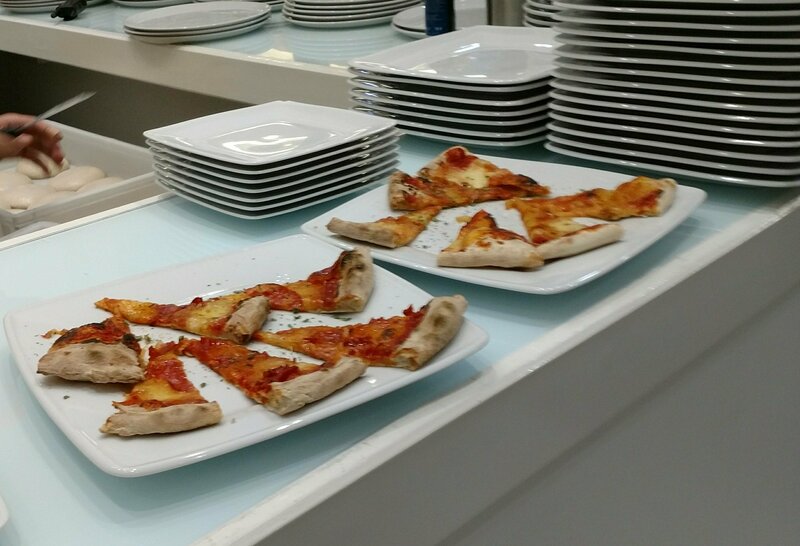 Whilst we didn’t order the pizzas, the ones I spied going out to other tables looked pretty good with a good base and decent toppings. I only managed to get a shot of some samples (ready to go out as freebies to passers by). The all Italian wine list is short, with 3 red, 2 whites, 1 rosé and 1 fizz. No producer details (generally the decisive factor in whether a wine is a good or bad wine), but I would (if I was drinking – working day lunch so wasn’t) probably go for either the Nero D’Avola or the Grillo wines as they are Sicilian. Not sure about the Sicilian merlot (a chap I know, who is quite the guru when it comes to Italian wine, reaction would be pour it down the sink – I would fear the heat in Sicily would risk a cheap merlot being unpalatably jammy for my tastes). Prices look fairly reasonable, with a bottle of the Nero D’Avola at £14.50 a bottle (retail Nero D’Avola goes for anywhere from around £5 to £15 plus depending on quality) and the Grillo also at £14.50 (retail prices starts at around the £7 mark, but can go north of £20). In Italian, it is usually best to go local/the indigenous grape wine wise in a restaurant and as these are wines made from grape varieties indigenous to Sicily I would (bearing in mind the places roots) hope they would be ok examples. If you are ordering pizza here, the Montepulciano d’Abruzzo is probably the best option – generally a good pizza wine. It is nice to see all the wines are offered by the glass. and other sodas coming in at £2.50 a pop. This seem a touch expensive, when somewhere like Milk & Sugar in the Old Library is charging £1 for the same thing. I rather liked Ciliegeno. 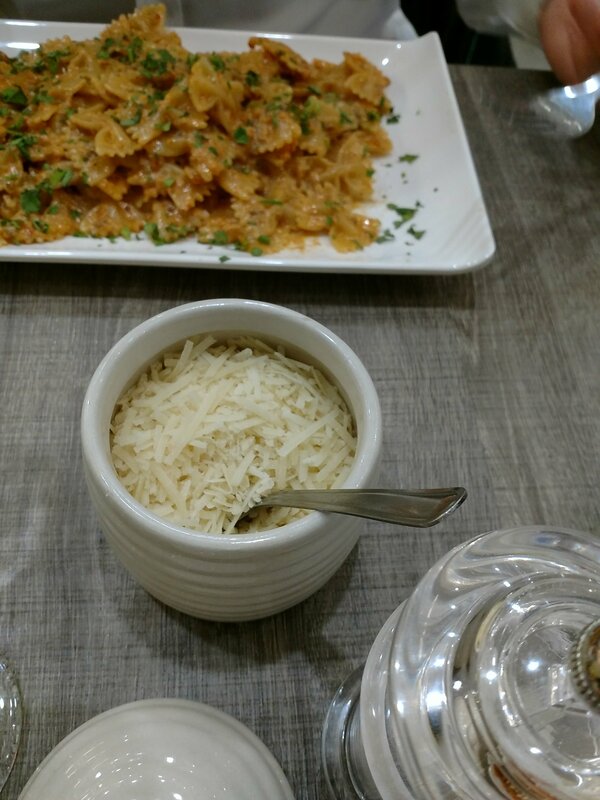 The food is tasty and plentiful and the service is pleasant and efficient. My only (slightly odd, I know) qualm is that for lunch the portions are quite big and prices are not particularly cheap. This means it is unlikely to go in my regular lunchtime haunt folder (good option before or after cinema visit). The £9.90 meal deal, puts them in the same price bracket as the Asador 44’s £10 lunch offer (although here they do throw in a soft drink for the price) and that is tough competition. If you are looking to order outside of the meal deal offer, the prices put them pretty much in line with those at Cafe Città. Again stiff competition. 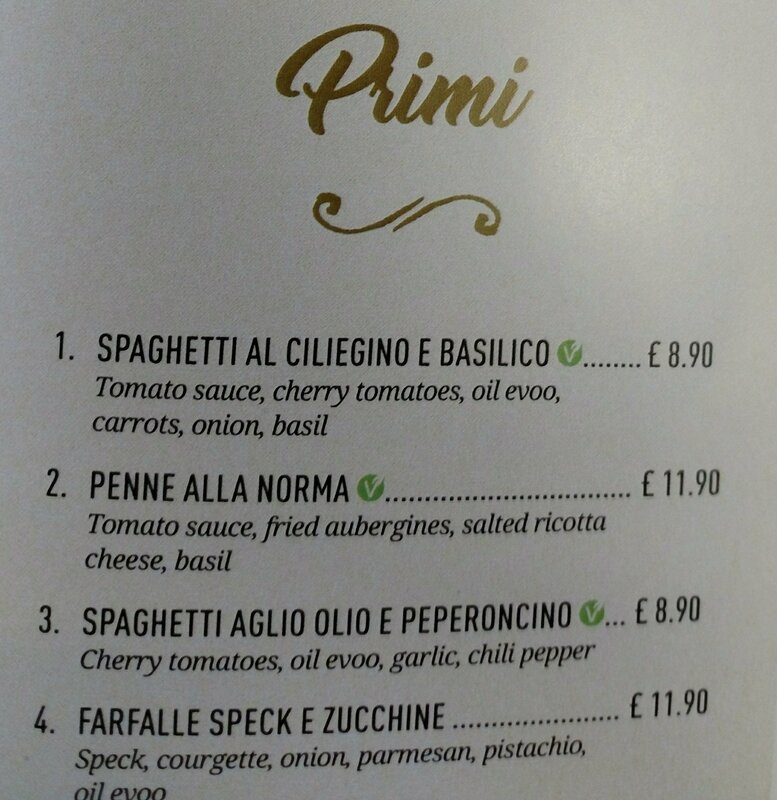 I would add a lunch menu with a smaller portion sized pasta (and pizza) dish(es) on it- say at £6.95. Soft drink prices could also be reduced (can always order tap water – which people may only go for if soft drinks are priced too ambitiously). 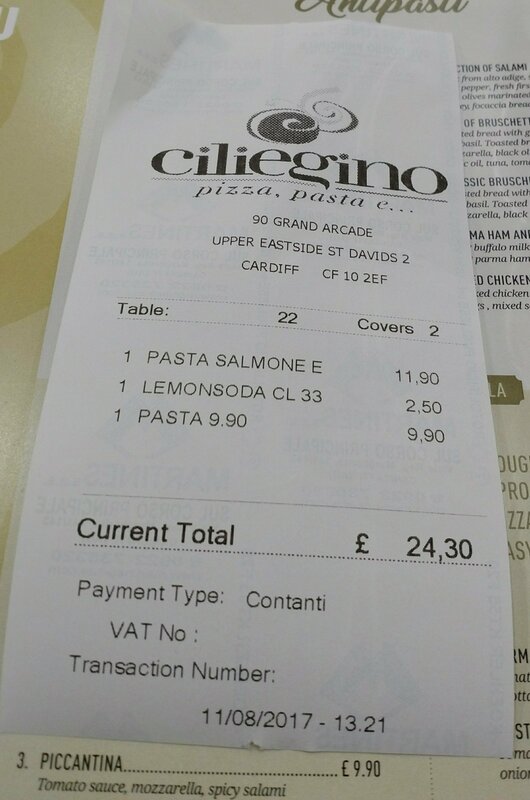 We paid just over £24, with my pasta, side and drink making up £9.90 of that sum. I thought it good value for what we got. If we had had two of the meal deals it would have come all in at under £20. Would I go back? Yes – it is a cut above most of the stuff in St. David’s 2 and therefore can only be regarded as a good addition to the food offering in there. Opening hours: Mon – Sun: 10.00 – 23.00. 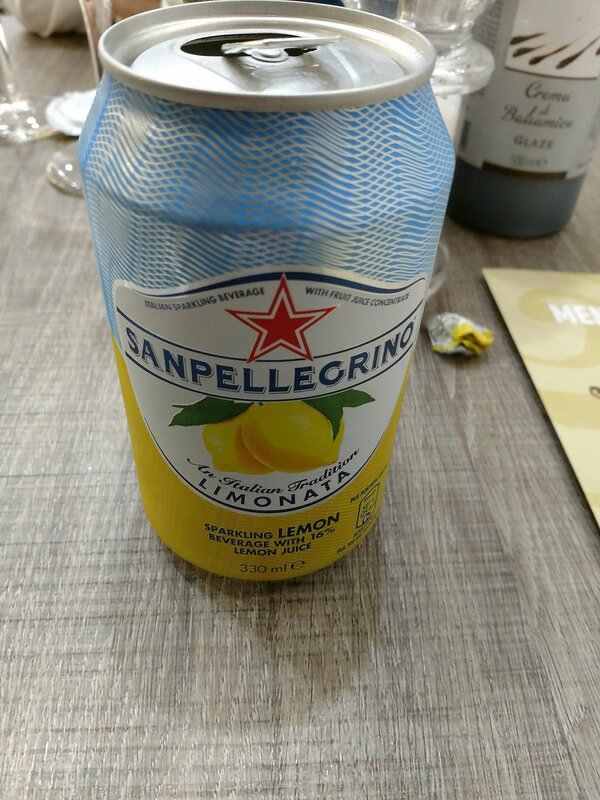 This entry was posted on Aug 13, 2017 by solicitingflavours in Alcoholic drink, Asador 44, bistro, Cardiff, Cardiff restaurant, cheese, Ciliegino, coffee, Drink, Dry white wine, Fixed Price Menu, Food, Food and wine products, Grillo, Ice cream, Italian, Italian wine, Italy, Lunch, lunchtime, Nero D'Avola, New restaurant Cardiff, Non alcoholic drink, Pasta, Pizza, Red Wine, restaurant review, review, Rosé, salad.